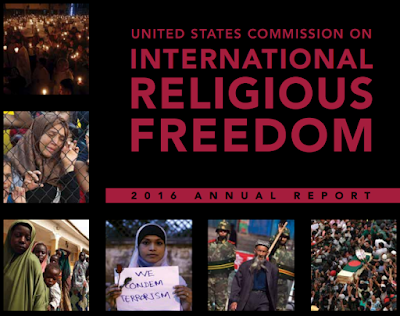 The just-released 2016 annual report of the US Commission on International Religious Freedom (USCIRF), expressing serious concern over “negative trajectory” on religious freedom in India, has warned that it may, in future, seek to downgrade India’s status from Tier II countries to “country of particular concern”. Asking the US government to “integrate concern for religious freedom into bilateral contacts with India, including the framework of future Strategic Dialogues”, the report wants the U.S. Embassy to address “issues of religious freedom and related human rights” in India. Expressing dismay over refusal of the Government of India not allowing the US Commission to visit India, the report has urged the United Nations Special Rapporteur on Religious Freedom or Belief to visit the country in order to find out how things have developed in the recent past. Noting how “the national government or state governments applied several laws to restrict religious conversion, cow slaughter, and foreign funding of NGOs”, the report recalls how in December 2014, Hindu nationalist groups announced plans to “reconvert” thousands of Christian and Muslims families to Hinduism as part of a so-called Ghar Wapsi (returning home) program. “In advance of the programme, the Hindu groups sought to raise money for their campaign, noting that it cost nearly 200,000 rupees (US$3,200) per Christian and 500,000 rupees (US$8,000) per Muslim”, it says. 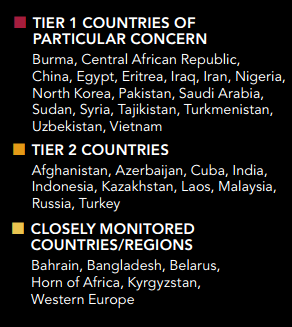 “Among the affected organizations were Christian NGOs that receive money from foreign co-religionists to build or fund schools, orphanages, and churches, and human rights activists and their funders”, it says.